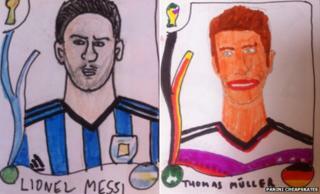 A couple have completed a "mad dash" to finish a World Cup sticker album filled with their own drawings of players. Dubbed the "Panini Cheapskates", Alex and Sian Pratchett, from Oxford, aimed to have recreated all 639 stickers of the Panini album by the time the World Cup final started at 20:00 BST. And in the final hour before the game between Germany and Argentina was due to begin, they drew the last player. Mr Pratchett said their unusual labour of love might now be sold at auction. On completing the album by drawing the last player - the Spain forward Pedro - Mr Pratchett told the BBC: "It's such a silly thing, it's hard to say we're proud exactly, but I'm glad we stuck with it to the end. "A lot of people seem to have found it weirdly interesting. "And if anyone has looked at this and chuckled then that makes it worthwhile," he said. He added that one of the final flourishes of the couple's unusual World Cup campaign was to create drawings of themselves to put inside the front cover of the album. The couple began their quest on the opening day of the World Cup and have been posting images of their drawings on a blog. Earlier, when the pair still had 15 empty slots, Mr Pratchett said they were in "a bit of a mad dash" to get them filled. "It would be lovely if we did get finished before then as it would be the first match of the whole World Cup we could properly focus on," he said. "Most of our time has been spent staring at tiny bits of paper and pencils." Mr Pratchett tried to complete the 1994 Panini World Cup album when he was 11, but "never quite did it". This year's homemade effort was Mrs Pratchett's money-saving idea. Mr Pratchett has previously admitted some of the early sketches were "awful", particularly one of German midfielder Mesut Özil, but he said they had been improving over the past 31 days. On average the Cheapskates complete about 12 drawings a day, with each one taking about 20 minutes. He said the finished album might be sold at auction, with the proceeds going to his local team Union Street FC.